Richard Mendelson brings together his expertise as both a Napa Valley lawyer and a winemaker into this accessible overview of American wine law from colonial times to the present. It is a story of fits and starts that provides a fascinating chronicle of the history of wine in the United States told through the lens of the law. From the country's early support for wine as a beverage to the moral and religious fervor that resulted in Prohibition and to the governmental controls that followed Repeal, Mendelson takes us to the present day—and to the emergence of an authentic and significant wine culture. He explains how current laws shape the wine industry in such areas as pricing and taxation, licensing, appellations, health claims and warnings, labeling, and domestic and international commerce. 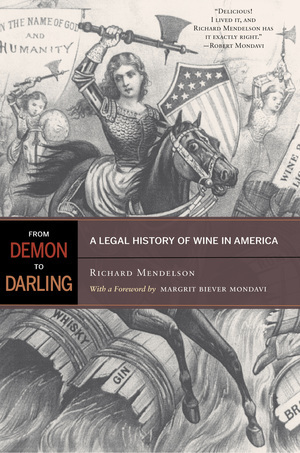 As he explores these and other legal and policy issues, Mendelson lucidly highlights the concerns that have made wine alternatively the demon or the darling of American society—and at the same time illuminates the ways in which lives and livelihoods are affected by the rise and fall of social movements. Richard Mendelson is a wine law specialist at Dickenson, Peatman & Fogarty in Napa, California, and Lecturer at the University of California at Berkeley School of Law, where he directs the Program on Wine Law and Policy. He also owns Mendelson Wines.